Okay, this is my first give-away so be gentle with me. I wanted to give away a little something because I am so grateful for everyone's emails, comments and visits. I have reached over 7,000 hits since starting my blog this past summer. For a hobbyist who stamps in her jammies every night, that's not too bad, huh? I'm going to make it easy on you . . . just post your comment and I'll randomly pick a winner on Monday. You'll receive everything in the picture which is: the cute little Valentine's bag, 2 stamps and 1 stamp set from Studio g from Michael's, a package of self-adhesive chipboard letters, lower case from Paper Studio, 4 rolls of Ribbon Trends ribbon (2 pinks & 2 reds), and some bling, baby . . . adhesive rhinestones from K&Company. Looking foward to hearing from you! Nice blog. Your blog candy looks great. I hope I win it so that I can use the rhinestones on my valentine cards this year! Thanks a lot. Your blog and ideas are wonderful....keep on sharing your creations!! Thanks!! I just learned about your blog today! After posting this comment, I'm going to go and check it out! I craft in my pj's too! I have insomnia. I love your challenge #7 card - very calming to look at. Thanks for this offer, and congrats on the hits. I don't stamp in my pjs but I surf the blogs in them. Count me in on this sweet candy! Great blog and just love your creative and inspiring artwork. I like your style...stamping in PJ'S! Thanks for a chance. Love your blog, you're very talented. Thanks for offering blog candy, it looks so yummy. Thanks for the chance to win. Love your blog - I'm a newbie at blog hopping and just found yours. I cased your m&m goodie box! Thanks for sharing! Your blog is wonderful and I look forward to seeing your new creations - keep up the good work and congratulations on 7000! What a nice thing to do. This is some great Blog Candy. I'm sure there will be lots of girls hoping to win. Congratulations on so many hits! Keep up the great work! very lovely blog!!!! congrats on your hits!!! I love your gift ideas...they are so cute! I can't wait to try some of the ideas and hopefully win this great set to make valentine gifts for my twin boys' preschool class. WOW ~ what a fabulous giveaway! Thanks for the chance. What a great giveaway! I admire anyone who can even start a stamping blog. Congrats on you many hits! Hi there! Nice blog! I love your M&M goodie box. I sure miss my stuff. We've moved (military) and our stuff has not arrived yet. I can't wait to get all my stamp supplies back and start stamping again. I miss it soooo much! I can't keep my blog updated either because I have no projects to update it with. Thanks for the opportunity to win some blog candy! What a great assortment of Valentines goodies you have in your blog candy! It would be so fun to have them to play with while making cards and treats for my friends. I just found your blog a week or so ago and have already been through the whole thing! Love your inspiring ideas! Thanks! Hope you don't mind, Avis told me about your BLOG and I just had to visit. As usual, your projects are simply adorable..I really like your "I only have eye's for you". Thanks for sharing your ideas! Congratulations! You reached 7000 very quickly. 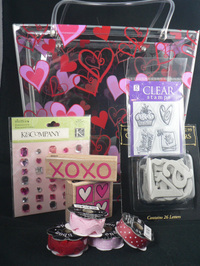 Someone will be able to make some awesome Valentines with this bundle of blog candy:) Thanks for the chance to win. i love your blog and i love blog candy! seriously who invented this idea? have a great weekend! Great blog and blog candy, I'll be back often to check out your stuff!